Best Practices for Food Production in Areas Suspected of Contamination offers best practices for urban gardeners, farmers, and grassroots greening groups to minimize exposure to contaminants both on- and off-site; discusses meat, milk, and egg production in urban settings; and explores special considerations of vulnerable populations and environmental justice communities. Download Best Practices for Food Production in Areas Suspected of Contamination. 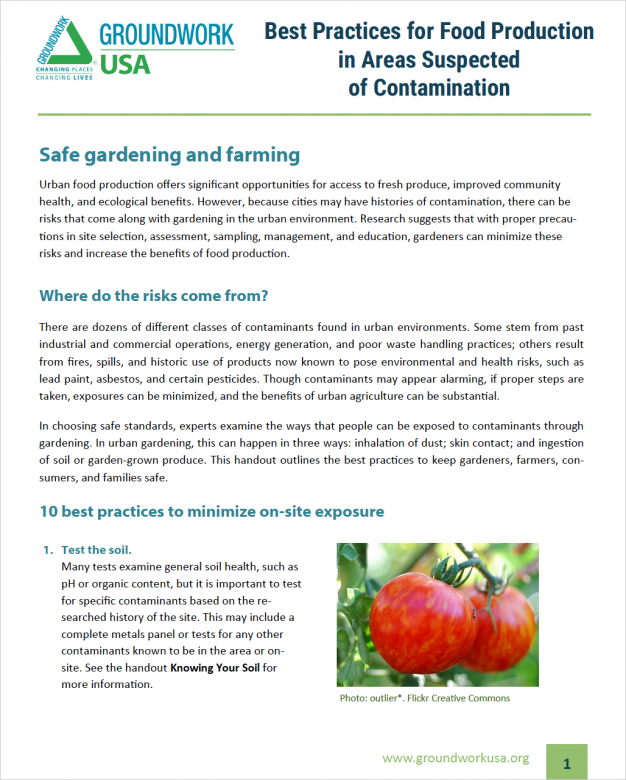 This fact sheet is part of a set of tools produced by Groundwork USA to build the knowledge and capacity of practitioners wishing to explore gardening and urban agriculture on properties suspected of past contamination. Learn more about Groundwork USA’s robust technical assistance program to support equitable development and environmental justice pursuits in brownfield-affected communities.